Eating Meat has been a human characteristic since ages. For survival, our predecessors had to prey on weak animals. Days have changed, but our love for meat hasn’t. We live in a much civilized society now, but our lust for meat has given rise to hundreds of mouth-watering non vegetarian dishes. As per the recent statistics by UN, the world is inhabited by 92% non-vegetarians, while only 8% are vegan. Are you one of them? Have you been refraining all your life from consuming meat, because it has many health disadvantages? But, this article is here to prove you wrong. Today, the myth about meat and chicken being unhealthy, will be debunked. Read on to know about the 10 ways how eating meat and chicken is healthy for your body. With a rather high content of protein than anything that you can possibly eat, Chicken is one of the most consumed animals in the world today. It has got very little fat, and if you have been looking forward to a muscular physique, then chicken should be in your staple diet. Therefore, gone are the days, when you were looking for low fat proteins, because here it is, Chicken. But, one thing should always be kept in mind, that frozen chicken contains relatively low protein than fresh chicken. So, consider buying fresh chicken than frozen chicken. With the growing popularity of chicken, there are several delicacies available. Especially boiled chicken dishes are very healthy. The chicken soup or soup made with any other meat, is a great appetizer. Chicken or any other type of meat when boiled, gives up zinc, which in turn enhances the appetite. Having a bowl of soup before a heavy meal will not just add to the delicacy but will also escalate your hunger. It will simply add to the hunger, and this soup is also tasty as hell. Try chicken soup before a meal and we are sure that you will understand the difference. If you are depressed, and cannot get out of the mood for some time now, you must surely try the chicken soup once. Chicken soup is supposedly a great anti-depressant because of the serotonin quantity that it induces in the body. Depression is primarily caused by the decrement of the serotonin level of the body. This chicken soup will help you get a good night’s sleep and will turn your mood. So, the next time you see a sad soul walking around, make him/her a steamy bowl of chicken soup, and this will surely swing his mood towards good. And, if you are a Vegetarian, obviously we can’t force you, but we can just advice you to eat chicken soup, if you are feeling low. As we said, Chicken and other meat products have a lot of protein, and chicken especially is a low fat protein. For kids, there are often issues with their immunity systems which can be avoided or kept at bay by the inhibition of Chicken in their daily diet. Boiled Chicken with pepper soup is a great dish to fight cold. Because of having a vulnerability to disease, growing children should always be induced with more protein in their diet. As we all know, protein contains amino acids, which in turn helps the kid to grow taller and stronger. For adults also, chicken helps in several immunity related problems. Inhibition of Chicken in the daily diet, is hence a win-win situation, contemplating both sides of the coin, taste and health! Arthritis has been rated as the disease which causes the most impairments in the world by a recent statistic. It is the inflammation of one or more joints, giving rise to excruciating pain. Chicken helps avoid arthritis. With a rich content of selenium, Chicken helps avoid Arthritis. Arthritis is often known as “old-age disease”, and chicken helps avoid Arthritis to develop at a later stage in life. Selenium is a mineral that strengthens your bone, which decreases the chance of Osteoporosis. After a certain point of time, Bone development stops, and there is no way that you can come back. Therefore, taking Chicken regularly from a tender age will help the body at a later time fight bone and joint diseases. All animal products include a considerable amount of Vitamin B12. Vitamin B12 is a very important vitamin for the functioning of the Nervous system and for the proper functioning of the brain. It also prevents a type of anemia called megaloblastic anemia. Vitamin B12 is also a great energy inducer and helps to fight lethargy and weakness. There is a myth that, Vitamin B12 can only be inculcated through Vegetables which is completely wrong, because every animal product naturally contains B12. Some of the best sources of Vitamin is Beef liver, meat and fish. Meat products and chicken, have protein, and protein is made up of amino acids. Amino Acid is one of the main constituents of the human body, and helps to fight diseases like obesity, diabetes, insomnia and arthritis. Amino Acids are one of the main constituents which are responsible for carrying out day to day metabolic activities. Irregular metabolic activity may cause liver damages, and intestinal malfunctions. So, at the end of the day, about half of the processes of the body are managed by the Amino acids. Deficiency of Amino acid may lead to wrinkling of skin and hair fall. Meat products are the biggest contributors of Amino acids in the body, so to maintain a healthy body, one must inculcate meat and chicken in their diet. There are many people who get stressed very often, sometimes in idiotic reasons, be it professional or personal. Chicken is a great de-stressor, and it instills a sense of goodwill in people. With Vitamin B5 or Pantothenic acid, chicken helps calm the nervous system. Calming the nervous system in turn, brings down the stress level. Therefore, next time you feel stressed after a long day in the office, make yourself a great dish of chicken. People use a lot of Ayurvedic and Organic product for the betterment of their skin, and to obtain a smooth skin. But, meat products and chicken, also can make your skin glow and look good. The presence of Vitamin A, Vitamin B, and Vitamin D, helps the skin to maintain its glow and keeps up a healthy skin. Though your vegetarian friend will not accept this, but science says that Fish and other meat product like Beef, is good for promotion eye vision. 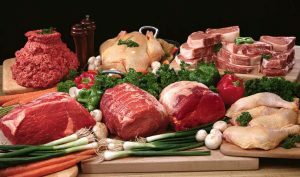 Since, meat contains many vital vitamins and proteins, it promotes a great eye vision. It would be difficult to accept this as first, but Fish is also known for enhancing one’s eyesight.